This beautifully written novel is about what happens when we assume we know the truth about something. It’s about the special bond between cousins. And it’s about what happens when we inadvertently worship someone, so much so, that we only see what we want to see. Frannie Little hasn’t seen her cousin Truman in a awhile, but she remembers that she’s always been in awe of him. So when she finds out that Tru is moving in with them for the summer, and it’s because he’s gay, and her Aunt and Uncle don’t know what to do with that information, she’s ecstatic. Or at least that’s why she thinks he’s coming. As soon as Tru shows up, Frannie knows that she can’t hold a candle to him. He’s everything she isn’t. He’s older, smarter, funnier, harsher. But she knows that if she tries hard enough she might be able to learn how to be just like him. 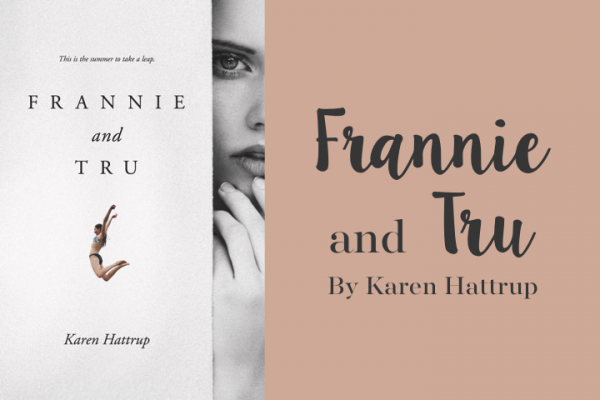 Frannie and Tru is a wonderful coming of age story that plays with many themes that the young adult genre is used to seeing, though somehow in Hattrup’s hands the ‘same old, same old’ has been given new life. Her writing is so beautiful that you’ll be saving quotes out of this novel, and reading her turn of phrase in awe. My favorite thing about Hattrup’s story is that she gives us a new twist on the Manic Pixie trope. Instead of giving us one of the dream girl variety, she lets Tru wear the hat. She takes something that can feel a bit tired, and gives it new life in the hands of a self-destructive, secondary, male lead. My second favorite thing is that it’s a coming of age story that focuses more on the family group than a romance to propel the lead to the end of the novel and beyond. As we watch the dynamic between Frannie and Tru change, Frannie comes to truly know Tru and all that he stands for, which is a bit heartbreaking. When someone you’ve worshiped for so long doesn’t belong on the pedestal you’ve placed them on, the aftermath can be unnerving. And in the end, that’s what this book is about. Our perceptions, and what happens when they don’t hold up. Previous articleA Book-Lovers Paradise: A Town of Books!